This full day seminar will be an introduction into the use of raw materials for making paint and traditional grounds. Paint Making: Since the invention of tubed paints, artists have slowly lost touch with the ingredients in paints. Many professional artists do not know that paint is comprised of pigments and a binder. Furthermore many artists are surprised to find out that making paint from scratch is quite simple and cuts their paint cost in half. Making paints also gives the artist access to historical pigments such as Lapis Lazuli and genuine Earth Pigments. These are pigments which have been abandoned by most modern paint manufacturers, but are essential in palettes used by such artists as Rembrandt and Van Eyck. Alex Warren will discuss all of the different binders available (oil and water-based) and what advantages are associated with each paint base. The making of oil paint, acrylic paint, egg tempera, casein (milk paint) and encaustic will be introduced and demonstrated. Additionally all of the pigments will be discussed. 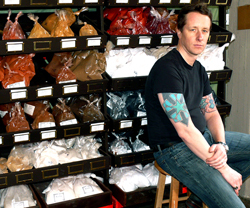 Participants will learn about the different pigment types and how to categorize the characteristics of pigments in order to make pigment selection a manageable task. This class is open to all levels of expertise and in-depth question and answer sessions are encouraged. Learn how to mix your own paints. Develop their own personal ‘recipe’. The Traditional Grounds: Acrylic Gesso is a surface that many artists take for granted and may not be the most ideal surface as a solid foundation for paint. Traditional Gesso made from Chalk and Rabbit Skin Glue is a rich velvety absorbent surface, which can be used for all media and is a required ground for such paints as egg-tempera, casein and encaustic. 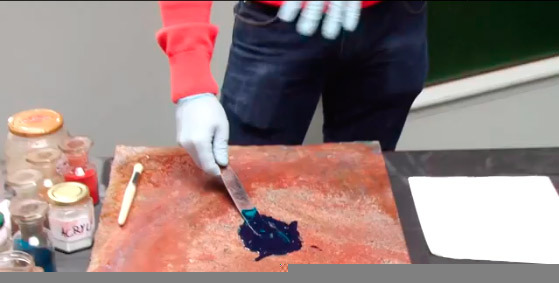 In this demonstration, Alex Warren will discuss different priming options for both canvas and panels. Traditional Gesso making will be demonstrated and each participant will work on their own panel. At the end of the class each participant will take home a gessoed panel. Traditional Gesso is also the foundation for water gilding, a process in which gold leaf is laid onto a soft clay bole surface and then burnished to a highly reflective luster. This class will provide a brief introduction into this ancient gilding technique.